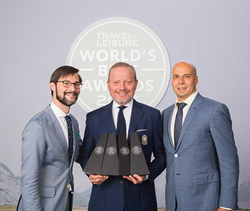 The Travel Corporation (TTC) is thrilled to announce that Travel + Leisure recognized three of their esteemed travel brands in the publication’s coveted 2016 World’s Best Awards. We are a fourth-generation, family-owned business with 100 years of luxury travel experience and each of our brands are committed to consistently delivering outstanding service, experience and value. The Travel Corporation (TTC) is thrilled to announce that Travel + Leisure recognized three of their esteemed travel brands in the publication’s coveted 2016 World’s Best Awards. The Red Carnation Hotel Collection, Uniworld Boutique River Cruise Collection and Lion World Travel were all voted into top positions by Travel + Leisure readers, including a total of four No. 1 placements and 15 total acknowledgments. Two of The Red Carnation Hotel Collection’s flagship five-star properties – Hotel '41' in London and Ireland’s Ashford Castle – were voted No. 1 in a total of three different categories, including “Best Hotel in London,” “Best City Hotel in Europe,” and “Best Resort Hotel in the United Kingdom and Ireland.” The Milestone Hotel, The Egerton House Hotel, and The Chesterfield Mayfair brought home an additional seven placements combined in several other categories. Red Carnation Hotel’s sister company Uniworld Boutique River Cruise Collection was named the No. 1 “Best River Cruise Line in the World” based on its personalized itineraries, quality service and outstanding fleet of beautifully designed ships. With fewer staterooms and a higher staff-to-guest ratio than other cruise lines, Uniworld offers the highest level of attention and a variety of immersive experiences that set it apart as the world’s best. “Red Carnation and Uniworld share the same design team and the same dedication to excellence, so it is not surprising that they were both awarded as best-in-class,” said Tollman. Finally, Lion World Travel was named the No. 7 “Best Safari Outfitter” by the discerning readers of Travel + Leisure. Lion World has 51 years of demonstrated African destination expertise and has become one of North America’s largest African agencies. All safari specialists have first-hand knowledge of the destinations they recommend, allowing them to confidently assist each client in creating a safari adventure that fulfils their specific interests and budgets. For more information about The Travel Corporation (TTC) and their 30 award-winning brands, please visit http://www.ttc.com.